Art heals. Poetry is art. Poetry heals. This is John Fox's companion piece to "Finding What You Didn't Lose" and well worth working through. It not only helps people delve into the places where they can heal, it helps those who work in healing professions to use poetry-writing as a guide for their clients.The book gives small successful steps to writing and frequent examples. I teach poetry as a way to growth as well as a way to concise writing. Both are supported in the book. A flexible, intelligent book that doesn't pander to the lowest common denominator, this is a solid poetry writing book for the soul, whether troubled or not. I've had this book for years and dip into it every once in awhile to encourage the muse. I finally decided to read it from cover to cover and enjoyed it all (even the parts I have read many times.) Fox has a somewhat more liberal view of things than I do, but he has really helped me find my poetic voice over the years. 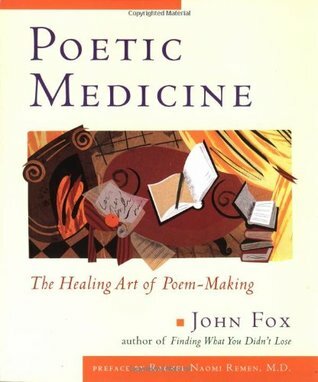 Such a wonderful book on the healing powers of poetry. YES! Loved it! I learned so much about following my heart into the words. As a novice poet I so appreciated this life affirming book. This book starts out a bit too woo-woo for my taste, but I'm glad I stuck with it. My favorite part was towards the end in his chapter "Poems of witness in a conflicted world." Making writing poetry as a form of self-expression is a must in my life. This book gave me many more outlets to inspire and share the love of poetry.